For high-throughput tasks such as 4K video playback or editing, the underlying storage dictates how quickly employees can move on to their next project. These workloads require ultra-fast storage so editors can scrub through assets, make changes without waiting for the storage to catch up, and play back the finished results without hitching. 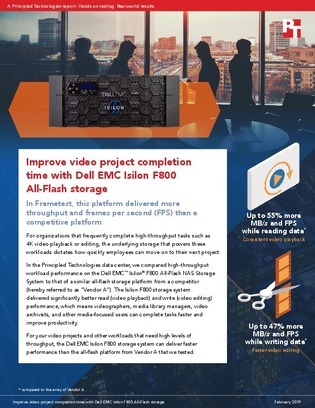 In order to help media-focused users complete tasks faster and improve productivity, Principled Technologies tests out high-throughput workload performance on the Dell EMC Isilon F800 All-Flash NAS Storage System in this paper. Read here for the results on read/write testing FPS and read/write testing throughput and uncover how you may be able to achieve similar performance benefits.